High-quality physical education provides students with the exercise they need to be focused and active learners, and it equips them with the knowledge and skills to be healthy and active outside of school. Research shows that physically active students are more likely to attend school, are better able to focus in class and ultimately perform better academically. Physical activity increases brain function, reduces disciplinary problems and increases test scores. A CDC analysis of 23 years of peer-reviewed studies and published reports addressing the link between physical activity and academic performance found that PE does indeed boost academic performance. The studies also suggest that increased time spent in PE is not likely to detract from academic performance even when less time is devoted to other subjects. Plus, PE equips students with knowledge and skills to build lifelong healthy habits. For years, PE had a reputation for dodgeball and annual fitness tests. Today, it’s about HOPE: Health Optimizing Physical Education. 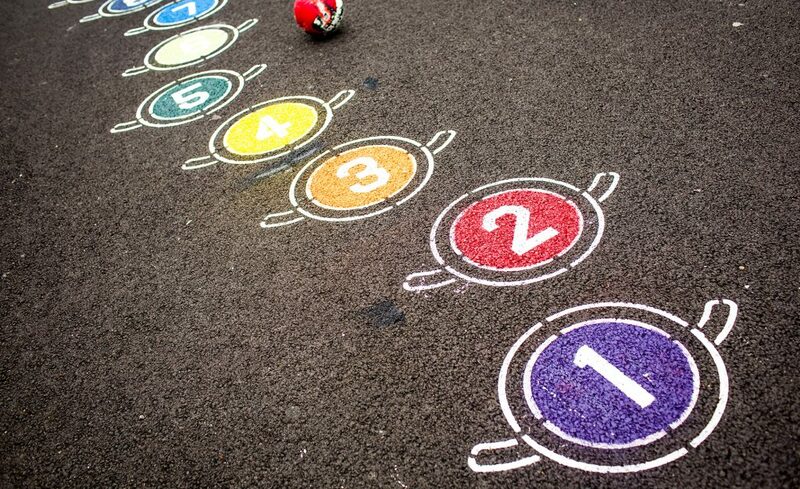 This creates a positive learning environment where students learn fitness and motor skills through a sequential path to become physically educated. The emphasis is more on cooperation than competition, more on developing competencies in lifelong activities rather than traditional team sports. For example, physical education looks more like a fitness club than a soccer game with one ball being passed among the most fit and skilled students. Perhaps most important, HOPE provides the opportunity for all students to engage in moderate to vigorous physical activity at least 50 percent of class time. This level of activity is key to accessing benefits for learning and fitness. 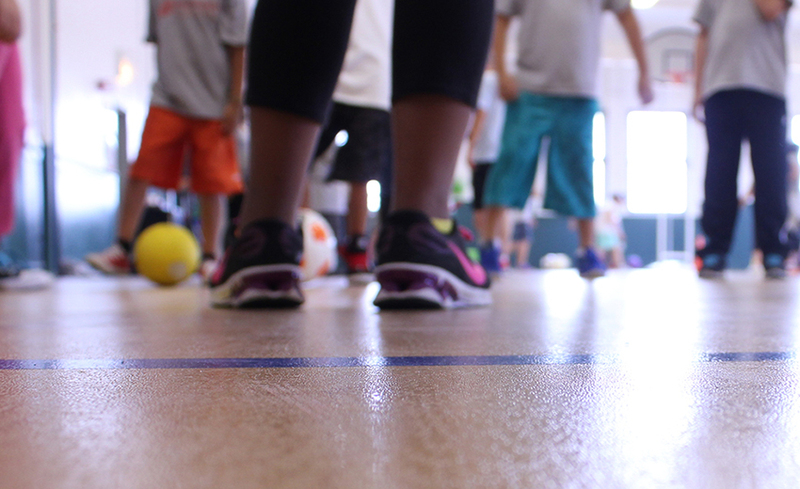 In 2014, CPS adopted a new Physical Education Policy that is bringing PE to more students than ever before. The policy, which will be rolled out over three years, requires high-quality daily PE for all students, giving physical education the importance it deserves as a core subject and ensuring that Chicago students receive the benefits of daily exercise. Until recently, most Chicago elementary school students received just one period of PE per week, while the majority of high school students received only two semesters of PE over four years. Illinois state policy has long required daily PE for all students. But from 1997 through 2014, CPS requested and received exemptions from that requirement. In fact, until 2015, CPS high school juniors and seniors didn’t even have the option to take PE. This is all changing with the adoption of the new PE policy. In high schools. CPS reports that 80 percent of juniors and seniors are enrolled in daily PE, with the remaining 20 percent using waivers to participate in programs such as JROTC and school sports. In elementary schools. All elementary schools have submitted plans outlining how they will implement PE. During the 2014-2015 school year, schools were required to offer 90 minutes of PE per week. For the 2015-2016 school year, schools are required to offer 120 minutes of PE per week, 60 minutes of which can be health education. For the 2016-2017 school year, schools must offer 150 minutes of PE per week. A focus on high-quality class time is key. This means students are engaging in the appropriate amount of vigorous physical activity and are developing skills that can help them stay healthy and active for life. CPS has developed new frameworks for PE curriculum and teacher assessments and is offering professional development to help teachers make the most of this new approach. Elementary and middle schools are to provide students in kindergarten through eighth grade with 30 minutes of daily PE or the equivalent of 150 minutes per week. Health education can be counted for up to 60 minutes per week, beginning in grade 5. At the high school level, the policy will require daily physical education in the same time increments as other core courses. Some individual student waivers will be available. Students are to be engaged in moderate to vigorous physical activity during two-thirds of all PE class time. Despite these challenges, CPS is making significant progress toward full policy implementation. The district also has several key opportunities. CPS is also piloting an innovative student fitness data system that will ultimately allow school leaders to observe the relationship between PE and academic achievement. Perhaps most important, teachers and principals across the district are getting creative and finding ways to work around significant obstacles to provide PE. We know that healthy students are better learners, and we believe PE should be an integral part of the school day for all students. We were an active partner in advocating for and helping create the new CPS PE Policy. Our approach to transforming physical education is based on an effective and time-tested model of working with key stakeholders to engage, advocate and build. Through our Fit to Learn program, we equip CPS principals with up-to-date research connecting PE with academic outcomes and provide practical approaches to incorporating high-quality PE into the school day. Through Fit to Learn, we’ve built a sense of community among CPS PE teachers and created a structured program in which they can support one another by sharing best practices and advice. Through our Parents United for Healthy Schools program, we bring together parents to learn about the value of daily exercise and the connection between physical activity and academic success, so parents are well-positioned to take action at their schools and to promote physical activity at home. Through Parents United, hundreds of parents spoke up at Chicago Board of Education meetings and gathered thousands of petitions in support of daily PE, helping make the district’s new policy a reality. Our staff and several Parents United parents serve on the CPS PE Leadership Task Force, helping advise the district on PE policy language and recommendations. We brought together 30 Chicago organizations focused on food and fitness to sign on to a statement calling on CPS to adopt a strong PE policy. Through Space to Grow, we’re transforming schoolyards at elementary schools across the city so that schools have more outdoor space for physical education and activity. With Fit to Learn, we’re connecting principals, PE teachers and classroom teachers with a shared knowledge about the tremendous academic benefits of quality PE and best practices for supporting PE. 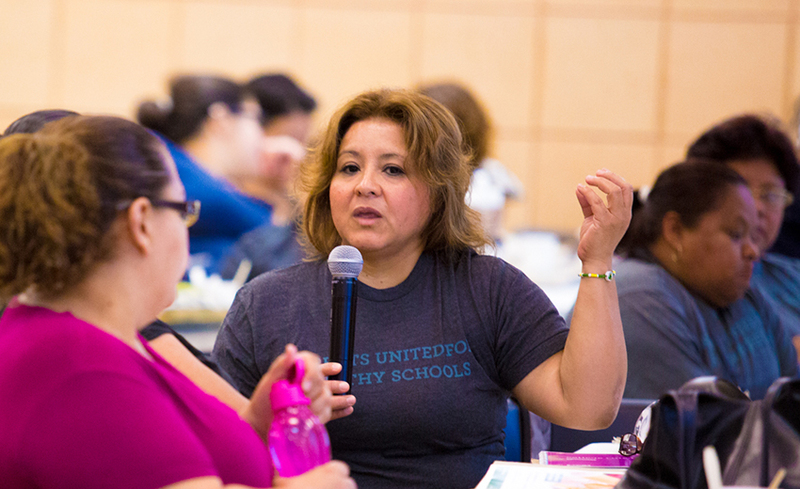 Through Parents United, we’re preparing parents to serve on school wellness teams and to share knowledge about emerging best practices for implementing daily PE and supporting physical activity at home. Your voice and your actions matter in the movement to make schools healthier places for all children to learn and grow. If you are a CPS teacher or principal, you can get involved in our Fit to Learn program. If you are the parent of a CPS student, we encourage you to join or create a wellness team at your school (keep reading for more), learn about tools to help create healthy change in your school, stay informed with HSC’s Chicago newsletter and connect with other parents through our Parents United for Healthy Schools program. If you are a school nurse, you can learn more about our School Nurse Leadership program. We invite and encourage everyone to learn more about and support our Cooking up Change, Space to Grow and Green Clean Schools programs, or learn more about national policies that impact all students. You can create change at your school by joining or creating a wellness team. The CPS Wellness Policy requires that all schools have a wellness team and a wellness champion to spearhead school health and wellness initiatives. Wellness teams are typically comprised of parents, PE teachers, classroom teachers, school health professionals, students, school administrators and community health and wellness partners. If your school already has a wellness team, we encourage you to join! Recruit team members. Begin by reaching out to the school principal; parents; teachers; the school nurse; facilities managers; school nutrition and food service leaders; and students. Also, consider inviting community members who may bring a particular skill or interest to promoting school health. Identify goals. When your team is in place, assess your school’s current needs. What are the most pressing challenges with student health and wellness? Outline your resources, what outcomes you want and what barriers you might face trying to get there. Think about the opportunities that currently exist and the strengths you can find in your community. Develop a plan. Now that you’ve identified your goals, write them down. Identify the strategies and milestones you can use to measure progress. Also, outline the step-by-step activities that will take you to success. Give allies on your team responsibility for specific steps. Take the first step. Remember that you don’t need to do everything at once. Often, a pilot program will be the best way to gain acceptance for your goals, work out any logistical problems and test different methods. Rate your progress. Regularly review the measurable outcomes you identified in your plan. Identify which steps have been taken, which milestones have been accomplished and what else needs to be done. If you’ve received any feedback, consider that in your progress report. Also, review the lessons you’re learning along the way. Give high fives. Celebrate your progress! To keep your team engaged and motivated, it can’t be all work and no play. Take time to recognize the steps you take successfully and the people working hard to make it happen. As a nonprofit organization, we rely on support from people like you so we can continue to make schools healthier places where all children can learn and thrive. Your gift–large or small–will make a meaningful difference.